Ralph and Sarah barely escaped the zombieclypse happening to the world, though not unscathed. Sarah is sick, delirious, and infected, while Ralph is out alone in the zombie-infested country looking for medicine to save her life. If she dies, she turns, and time is running out. A chance meeting binds Ralph’s fate to a stranger, a fate that brings him closer to his demise, and to a group of survivors. People get killed, others murdered, and the zombies are waiting, biding their time, for the time is theirs, to strike at those still breathing. 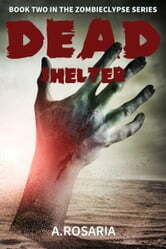 Sarah experiences a whole other kind of misery than the chase of zombies and survivors, for she is not alone. In this apocalyptic world, all misery is shared. Book is a good continuation of the first. Only problem with it is the amount of errors in it; misspellings, extra words, wrong words used. This is why only 4 of 5 stars. I know this is America, but you will think by now someone smart would have appeared on the story. Don't get me wrong, it is entertaining to read about a bunch of Sociopaths and psychopaths running around fighting Zombies and killing each other for no reason at all. Ralph needs to go wake up and smell the corpses. Looking forward to the next chapter.